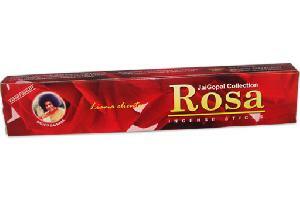 JaiGopal Collection- Rosa (15 Grams, 50 Doz / master carton), aromatic and non toxic herbal incense sticks. We use traditional methods in its manufacturing. Can be used in a variety of purposes like in living rooms, bedrooms, kitchens, for mediation and prayers. Wholesalers, Dealers and Retailers are Welcome.